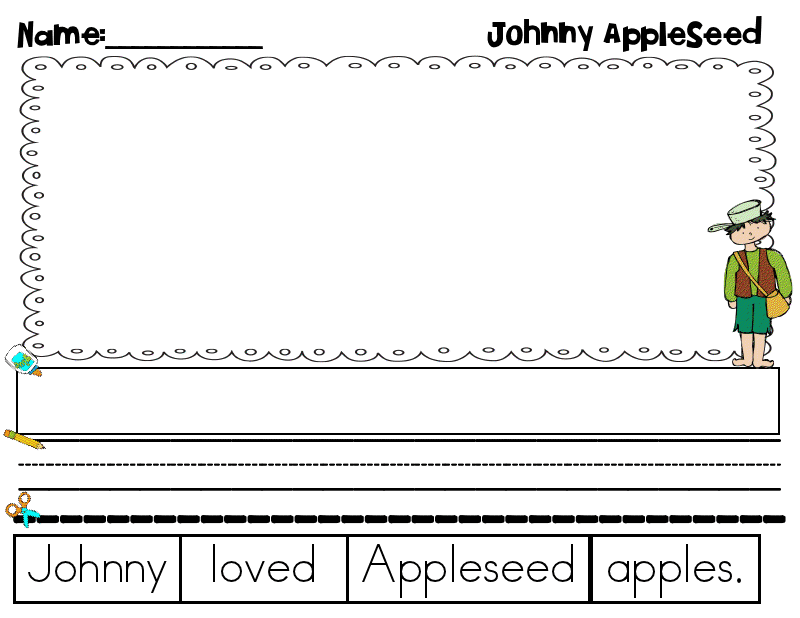 Blog Hoppin': Johnny Appleseed Art Project Goodness!! 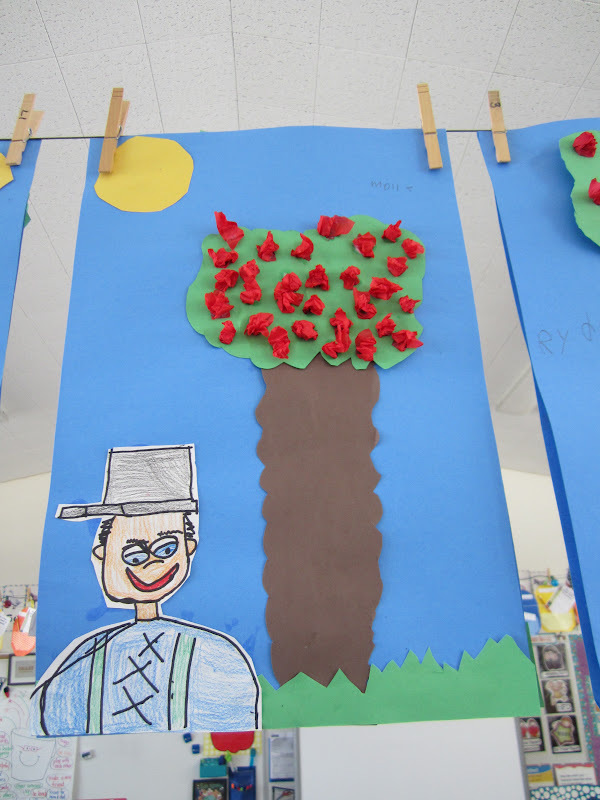 Johnny Appleseed Art Project Goodness!! Happy Sunday, Blog Hoppin' Friends!! I ALWAYS have my kids watch me do each step first, and then I pass out the piece of paper we are working on and they follow the directions I showed them. We call it "I do, then you do." I also usually start my projects at the bottom and work my way up, to ensure that they don't run out of room for everything. 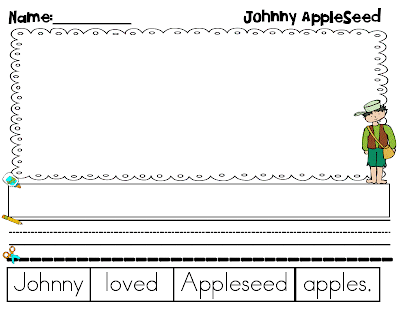 Here are the paper dimensions and steps for helping your little artists create their own apple trees (all pieces are construction paper)! Green grass- 2 inch x 9 inch green strip of paper. Instruct your kids to cut a zigzag, or crocodile teeth all the way down one side of the paper and then glue this to the bottom of blue paper. I always remind my babies, "No flying grass! Make sure it is glued to the very bottom of the paper!" Brown trunk- 12 inch x 4 inch dark brown paper. This piece is cut with wavy lines up both sides of the paper. I LOVE this step because their trunks come out SOOOO WONKY. It is FABULOUS! The trunk needs to be glued under the green grass. 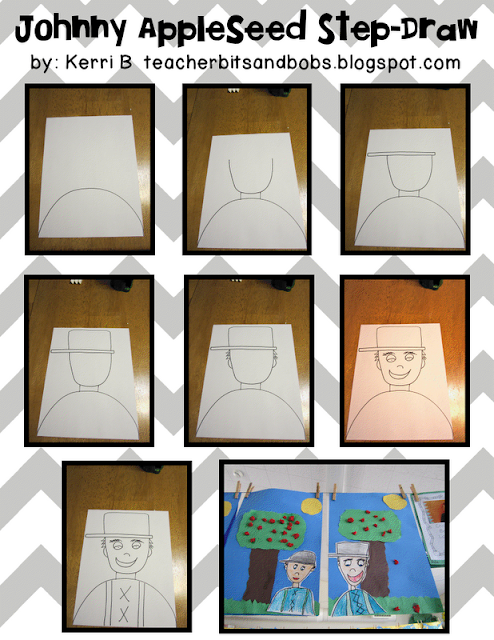 After cutting the paper into an oval, cut around the edges with a wavy cut and Badaboom! You have your leaves! Glue this OVER the brown trunk. Yellow sun- 3 inch x 3 inch yellow paper. Cut a magic square (see above. It is the same as a magic oval). This gets glued in either top corner. Red Apples- cut 1.5 x 1.5 inch pieces of tissue paper and show your kidlets how to scrunch each piece up and glue onto tree. I even let my kiddos glue 2 (only 2!!) on the ground and 1 (only 1!!) falling out of the tree! I know, I'm so nice and generous, right?? TADA!! Very cute AND totally original apple trees! YAY!! Click on the picture above to a get a copy of this one page tutorial via Google Docs! After we drew him in pencil, I let my kids use the coveted SHARPIES. Yes, it's true. They get to trace in sharpie. They feel oh-so-grown-up using these, and they are SUPER careful since I warn them that SHARPIE will NEVER EVER COME OUT, so you BETTER NOT GET IT ANYWHERE! (Strong enough warning??) At any rate, it works! They are sooooo super careful! After the sharpies, obviously we colored him in, and I am proud to say that not ONE of my kiddos colored a green or purple face this year, which is AWESOME. I think my dire warnings and my stink eye is really working on them-HA! The final step is called "Bubble cut" and I always cringe when I see them doing this step. It is so counter-intuitive for them NOT to cut on the lines after hearing me harp on all day about making sure they are cutting on the lines! Poor things! The reason we bubble cut (meaning leaving a little white border around the edge) is because if they cut on the lines their all their hard SHARPIE work would go bye-bye and it would look hideous! FINALLY, we glued Mr. Appleseed on the bottom and you have what the artsy types call "Perspective", meaning something in the foreground and something else in the background (I think??) We also talk about this fancy art word and they are impressed with themselves! Whew!! I am tired just remembering it all!! I promise you, your kiddos will learn SOOOO much from this art project, and your classroom will be filled with original masterpieces! That project is AMAZING! It is a must do this week:) Thanks for sharing. Crud Kerri! Now I have to go back and change my lesson plans! This is totally adorable. Cute! Cute! Cute! 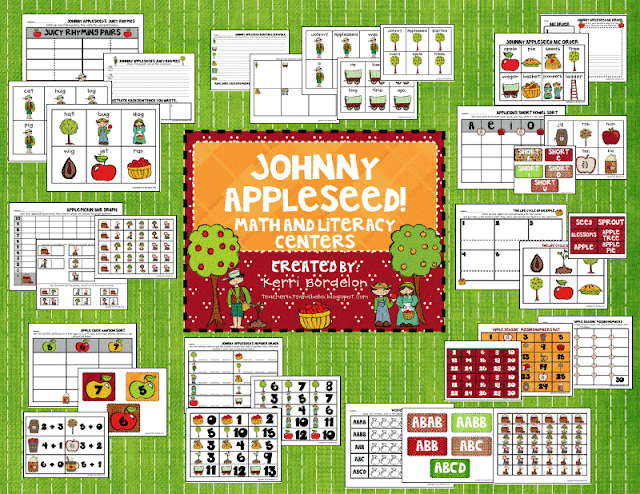 Your Johnny Appleseeds are ubber cute, thanks for sharing! The step-by-step Johnny crafts are so cool!! This activity is the BEES NEES!!! Totally adorable. Thank you for sharing. I just started my own blog about Kindergarten. If you have a sec, I'd love for you to check it out! Congrats, your post has been featured on T.E.A.C.H. at Cachey Mama’s Classroom. Click HERE to see and grab a featured button. "Monster Spray" Goes Digital + is on SALE!